Firstly, I know it's most likely that you'll have already seen these trousers on several blogs as EVERYONE has them, but in my opinion you can never have too much 'ways to wear' inspiration, so - I thought I would throw my hat into the styling ring. Top : River Island. Necklace & Trousers : H&M (eBay). Sunglasses : Camden Market. Lipstick : 'Morange' by M.A.C. Thirdly, and then the waffling will cease I promise, has anyone else noticed the 'follow' button has gone from the top left hand corner of blogger? I keep stumbling across people that I'd like to follow but I cannot, and in turn I've had people telling me they are unable to follow me. I'm hoping that it is just a temporary glitch, but I'd be interested to hear if anyone else has noticed this problem? I hope you are all having a happy week! Followed your Twitter, i was the same at first. I love the jeans, so gorgeous! 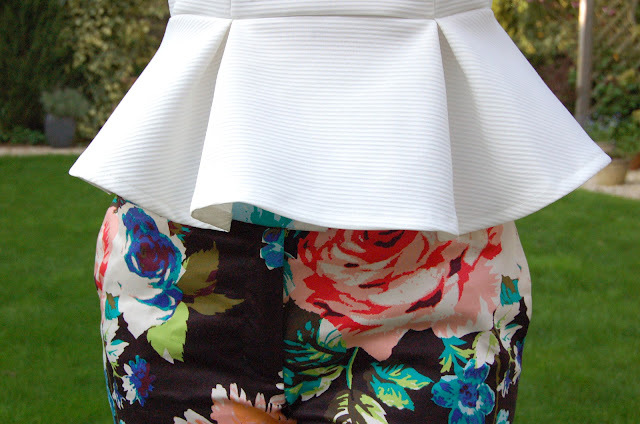 This is such a cool outfit, I love this peplum as well! This outfit is gorgeous! Love the peplum top. that top is completely divine. You're very right - can never have too many 'how to wear' type inspiration posts. Also, this look would work with any printed trousers, not just these H&M ones! Particularly loving your peplum top. Looks far more structured and striking (in a good way!) than some other High Street versions I've seen. I noticed the follow thing too, its a bit of a pain! I think you just use the 'Join this site' button on the GFC bit on their blog (if they display it) to follow now. I love the way you wear these trousers definetly different from the other ways people have been wearing them. I've noticed that the follow button has gone too, I thought it was just me going mad! Can't get enough of these trousers, love them! Perfect with a peplum tee! Follow button is gone for me too. love theese trousers they're beautiful! You look fab, i love how you have styled these trousers! I absolutely love this! 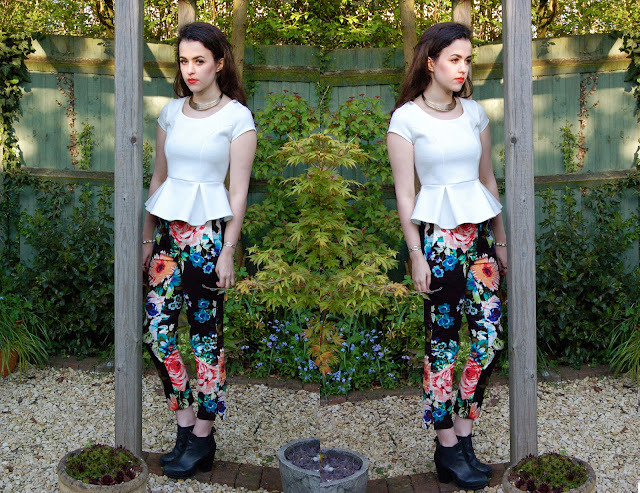 Probably my favourite way in which these trousers have been styled, I need a peplum top in my life. Lovely outfit! And yes, the follow button being gone is annoying! Hope it's a temporary issue. Love how you've styled the pants! love peplum tops at the moment! and YES oh my god, how annoying is the follower button thing, i thought it was just me! been having to follow people using the 'join this site' link above their gfc followers. thanks for commenting on my blog! Those boots are tdf! You may also have convinced me to invest in a pair of floral trousers seen as these look sooo good! You seriously have the most amazing style! The top is so nicely structured! You look gorgeous hun! Thank you, Arabella :) This look's amazing, really inspiring. You are so tailored and beautiful! totally following you! wow this is an amazing outfit! You wear those trousers so well! your top is incredible, i want some similar that i found in zara! I love the way you styled these trousers, so different to everything else I've seen. Love your beautiful peplum top! Big love for your outfit!! Oh yes, that follower button has disappeared as well, real annoying when I needed to follow the fabulous blogs I stumbled across- I just bookmarked it instead, only way I think. I really like how you styled these hon! 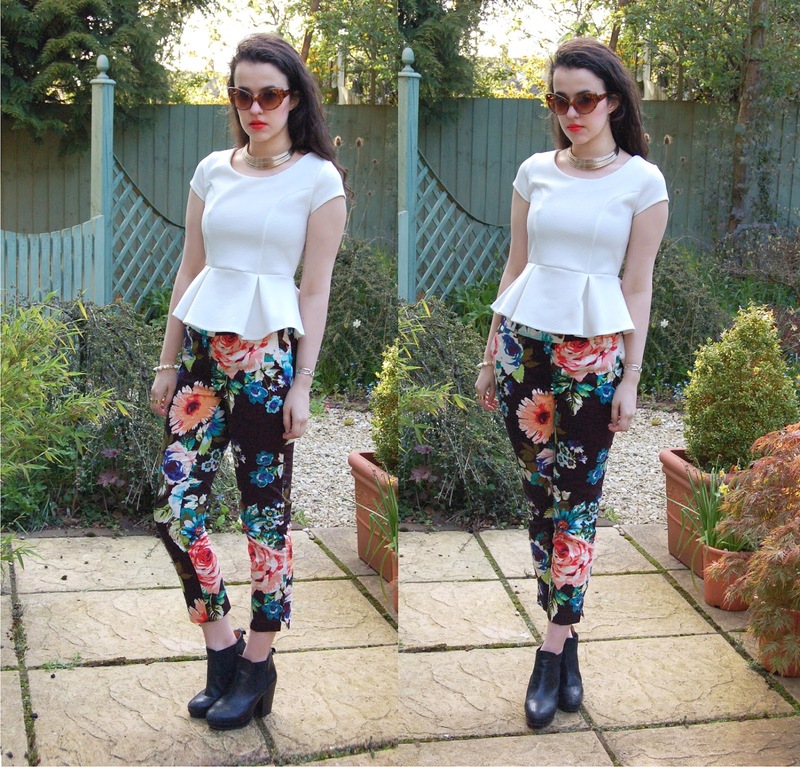 Gorgeous peplum top! I got a black one the other day and I can't wait to wear mine! Like how you have teamed it with the pants! And welcome to Twitter. The crazy world of relentless tweets and self promotion, it is just the inevitable in blogging!